This chapter studies 21 preservice teachers' blog reflections about working in an Italian classroom and living with a host family during a four-week study abroad program in Northern Italy. During the program, preservice teachers were required to blog about their experiences living and studying abroad using personal blog sites. To encourage more candid reflection about the program, the blog posts could be related to any aspect of the program preservice teachers chose to reflect on. After setting the context of the study through description of the study abroad program and its requirements, the authors present qualitative findings regarding preservice teachers' (a) thoughts related to their observations of Italian classrooms, (b) thoughts related to becoming an Italian language learner, and (c) lessons learned from the study abroad experience. Findings discuss preservice teachers' reflections on making sense of educational and cultural differences, experiences as Italian language learners, and opportunities for professional and personal growth. Preparing teachers to serve culturally diverse students is an important component of teacher education programs, particularly in today’s rapidly changing cultural landscape (Howard, 2003). However, teachers often have a deficit-based view of culturally and linguistically diverse (CLD) students (Ladson-Billings, 1994). Teachers may view these students as possessing shortcomings in language and learning rather than valuing the unique cultural and linguistic traits they bring to the classroom. Following Howard’s (2003) suggestion that teacher educators must re-conceptualize how preservice teachers are prepared to better serve CLD students, this chapter describes a four-week study abroad program that immersed preservice teachers in Italian school and family settings. Specifically, the program sought to engage preservice teachers in an enriched perspective-taking experience through study abroad that provided first-hand experience as second-language learners in culturally and geographically foreign home and school settings. Results in integration of the new understanding into one’s experience” (Rogers, 2001, p. 41). 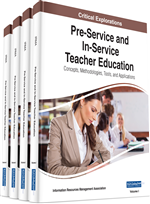 This chapter provides rich descriptions of such activities through a study of preservice teacher’s thoughts and experiences, gathered through analysis of personal blogs written during the program, as they participated in a study abroad program for education. Thus, the purpose of this study is to understand how preservice teachers perceived their experiences in an immersive study abroad program focused on cultural and second-language learning in Italian families and schools.